90 Days The HP StorageWorks Optical 30ux standalone product is meant for those that need long-term, permanent storage on their desktop or distributed environment. 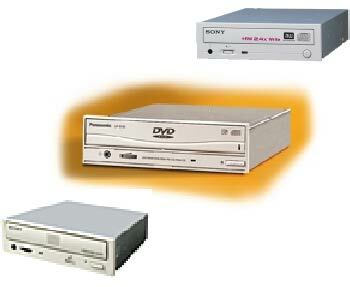 This product provides 30 GB of removable, WORM or rewritable storage. 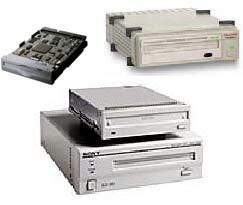 The 30ux ships with drivers for Windows 2000, 2003 and XP. 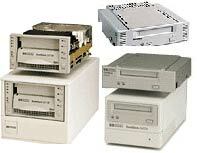 The 30ux is perfect for those working in computer aided design offering easy, secure desktop storage. These devices are also appropriate for remote point of sales (POS) capture devices providing a permanent log of transactions that can later be sent off site. The HP StorageWorks Optical Jukeboxes with 30 GB Ultra Density Optical (UDO) drives provides more, permanent, nearline storage at a much reduced cost. HP StorageWorks magneto-optical jukeboxes keep vast amounts of data at your fingertips, allowing to store and share information quickly, safely and affordably, year after year. Your application storage environment is growing. Applications that were never intended to be filin g cabinets of reference information have become digital landfills. But the information is valuable and you do not want to throw it away because you might need it. HP offers customers the flexibility needed to archive valuable, albeit less accessed, information assets with the choice of archiving to our industry leading optical-based solutions or our latest solution, active archiving to HP StorageWorks Reference Information Storage System (RISS). Whether you need fast access to archived content with RISS or permanent, nearline storage at a much reduced cost with HP StorageWorks Optical Jukebox portfolio, HP has you covered. Comes with powercord. Media and cables available but not included in auction. Thanks for looking and please have a look at the other items in our store which may be accessed at the beginning of this description. ** Credit Cards not accepted from outside US accept for UK and France. Shipping We ship worldwide. Shipping or Freight Calculator near bottom of auction page for use only to lower 48 states. Shipping to Alaska, Hawaii and all other destinations determined at end of auction. Unless otherwise stated in the auction, shipping charges are the responsibility of the buyer. Delivery We ship every day except Saturday, Sunday and holidays. Shipment usually occurs the day payment is received if before 3 PM Pacific time. Refunds & Returns We offer a warranty on most products. During the warranty period, any item found to be defective will be repaired or replaced. If we cannot repair or replace the item, a full credit or refund will be issued. Note: If a returned item is deemed not to be defective, a 15% restocking fee may apply. Contact Me We respond to all emails within 1 business day. We may also be contacted at the telephone number at the top of the auction page. We are open for business MON-Fri 9am - 5pm Pacific time. Closed for holidays.